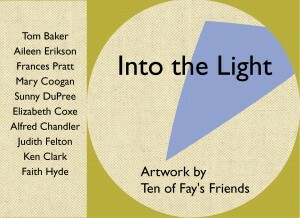 We are pleased to present Into the Light: Artwork by Ten of Fay’s Friends, on display now in the Chandler Gallery from January 18 to February 28, 2011. Join us for the opening reception on Thursday, February 3 from 6-8 pm. As in life, so in art, Fay Chandler castes a wide net of friendship and generosity. For this exhibition, she has selected work of ten artists who deserve recognition for their dedication to making art.They have all been involved in art over many years. Some have extensive and impressive resumes in art. Others are self-taught and late-comers to the making of art, after successful careers in fields as diverse as psychotherapy, banking, and strategic planning. Appy Chandler is a talented and powerful photographer, with a long and varied career in documentary production, foundation, and museum work. Tom Baker is also an accomplished photographer whose images of Paris barges are rich in innuendo. Mary Coogan integrates art and psychotherapy in her career, finding inspiration in the “human condition.” Faith Hyde brings a light touch of humor and whimsy to her drawings. Observation and the play of light are also at the core of Elizabeth Coxe’s plein air and figurative paintings. Sunny Dupree responds to the natural world in a painterly, intuitive way. Aileen Erikson‘s constructed paintings pair the seemingly naive and sophisticated, the flat against the dimensional. Judith Felton’s delicately abstract constructions invite close appreciation of overlapping shapes and textures. Frances Pratt has a long record of commissions and exhibitions of her abstract sculpture. Ken Clark’s presentation of a dvd of fireworks he orchestrated promises to be a highlight of the opening reception. As anyone who has encountered Fay Chandler’s magic “circle of friendship” can attest, it is a luminous, mischievous, and delightful place where humor and intuition reign. 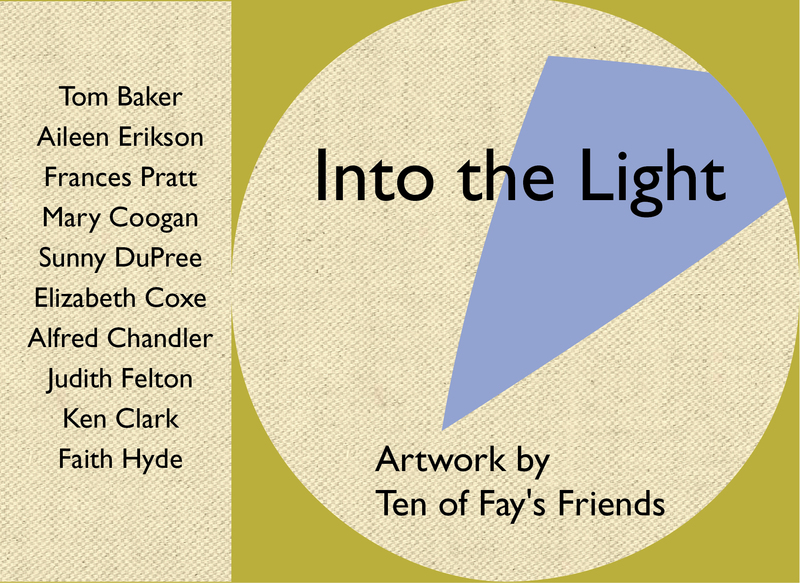 In this show, Fay has chosen to shine her light on ten very fortunate artists.